For a unique flavor, try the Black Velvet Cognac flavored coffee. Made with 100% Arabica beans, this coffee features flavors of rich chocolate, strong cognac undertones, and a rich smoothness. If you like to indulge in cognac, which is a form of brandy, you will love this chocolate-cognac inspired treat. 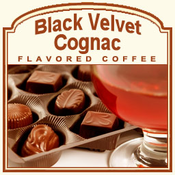 The strength of this cognac-flavored blend mixes with the chocolate flavors creates a scrumptiously delicious coffee roast. A heat-sealed valve bag will ensure the freshest coffee possible, which is why this Black Velvet Cognac will be roasted and shipped on the same day. Enjoy the full flavors that will make your mouth water for more!